"From one old engineer to another: thanks, mate." 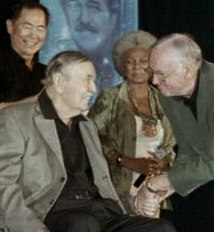 Neil Armstrong congratulates James Doohan during the actor's final appearance at a Star Trek convention in August, 2004. Armstrong, the keynote speaker at a banquet in Doohan's honor, was an engineer prior to his NASA career. Doohan died on July 20, 2005, the 36th anniversary of the Apollo 11 moon landing and Armstrong's first walk on the moon. Other kids worshipped baseball players. My hero was a fictional Scottish engineer from the 23rd century. Before the terms geek and nerd entered the vernacular, we were called brains, or, more cruelly, weirdos. We built Heathkits, disassembled televisions and tape recorders, and bribed the librarian to give us first crack at the new issues of Popular Science and Popular Electronics, usually by changing the ribbon or switching the golf balls on her newfangled IBM Selectric. The normal people left us alone until they needed their eight tracks fixed, or someone to set up the projector for health class, or install a new ink pad on the mimeograph machine. Task completed, we would be summarily dismissed with a curt thank you. We'd return to the backstage of the auditorium/gym, the traditional sanctuary of the oddballs on the audio/visual team. Scotty was our hero because he was one of us. Instead of the backstage, he was buried in the bowels of the Enterprise's engineering section, which wasn't even in the main part of the ship. There he ruled, serenely, totally in control, obtaining supreme satisfaction in the knowledge that while the idiots on the bridge were supposedly in charge, he was the one who made possible their continued existence. And then there was the Spock business. We Scotty aficionados resented the Vulcan science officer. In the first place, the whole "I'm totally in control and have no emotions" thing was patently dishonest. He was like the guy on the AV squad who discovered girls over the summer and was suddenly Mr. Cool. Yeah, right. When his girlfriend dumped him for the football team towel manager (quasi-athlete is still better than certified nerd), he nearly fried the pre-amp in the PA system by replacing the 1 megohm resistor in the main power supply with a 1K unit while in his emotionally distraught state. Spock was our high school principal, a pointy eared deus ex machina who appeared and broke the rules of the game. I recall spending days overhauling the motor and drive assembly of an old Wollensak reel-to-reel mono tape recorder, finally getting its wow and flutter back within specs. Rather than praise my efforts, the principal said "Oh, we'll just buy a new one." Buy a new one? The possibility had never even been presented to me! This is the parsimonious wretch who only two weeks ago made me use rubber bands to replace the capstan drive belt to save 50 cents! No wonder Scotty drank himself into oblivion when he was off duty! The Star Trek writers used Spock and abused Scotty in the same manner. They placed the Enterprise in some ludicrous situation which had no resolution, then sent Spock down into engineering to order Scotty to perform some action totally in violation of Trek's already delusional laws of physics. Until the arrival of Bill Gates, Scotty was the first expression of the belief that the nerds could probably run things better, but were disinclined to deal with such mundane challenges. Notice that when he was forced to take the con of the Enterprise- usually because Kirk was being held captive by the father of the native princess he'd just boinked into delirium, and the hyper- intelligent Spock had been rendered unconscious by a judiciously applied blunt object wielded by an alien with the appearance and IQ of a turnip- Scotty was by far the best strategic commander of the lot. When you saw him in the captain's chair, you knew Kirk and Spock had screwed up yet again- but you also knew things would turn out fine because the Scotsman would handily defeat the enemy du jour and would beam his sorry superiors' behinds back up to ship before the last commercial break. And then what would happen? The episode would end with Kirk and Spock congratulating themselves on their ingenuity while Scotty had already disappeared back into the depths of engineering to deal with the real responsibility of keeping the ship running. Those of you who have saved customer presentations, demos and initial installations from ten-thumbed marketing types know what I'm talking about. The suits go out for a night on the town to celebrate their technical savvy and sales skills, while you're stuck in the cheap hotel room with a poorly stocked mini-bar that you're not permitted to access anyway because of the cost, on the phone resolving a customer crisis while simultaneously answering inane support questions via e-mail. And frankly, you're happy about it. Who wants to listen to salesmen talk about sports? Finally, Scotty embodied the benefits of technology and the "can do" attitude that pervaded the 60s. Oh, he might complain mightily about some absurd demand being placed upon him: what geek isn't conservative when it comes to maintaining stable environments for critical systems? But he believed, as did his real-world counterpart Gene Krantz, that "Failure is not an option." It's the unspoken challenge that motivates those of us for whom Scotty is the ultimate role model. Montgomery Scott, the fictional character, will continue to perform engineering miracles indefinitely on film, video, DVD, and media yet to be devised. For that, we are grateful. 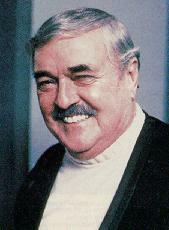 But I sincerely mourn the passing of James Montgomery Doohan- ironically, on the 36th anniversary of the first manned moon landing- who made Scotty the cultural icon he became. The word is given, Mr. Scott. Warp speed. Although he died on July 20, 2005- the 36th anniversary of the first manned moon landing- Jimmy Doohan is and will remain immortal, thanks to his portrayal of Montgomery Scott, Star Trek's iconic chief engineer. His fans are legion and include the first human to walk on the moon, engineer and astronaut Neil Armstrong. Notorious for avoiding the public eye, the reclusive astronaut nonetheless attended a 2004 Star Trek convention marking Doohan's last public appearance. Shaking the actor's hand, Armstrong said, "From one old engineer to another- thanks, mate." Here's a eulogy to Scotty, and a great story I heard Doohan recount at a Trek Convention in Pittsburgh in the late 80s.